We are an automobile transport company that specializes in providing superior personalized service to our clients and “white glove” handling of their automotive investments. Please enjoy our website and don’t hesitate to contact us if we may be of service to you and your special automobile. Thank you for visiting and come back often to see what we have been up to. 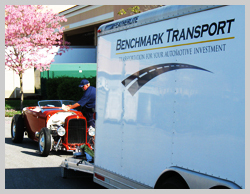 Benchmark Transport specializes in providing personalized enclosed automobile transportation services. Our clients demand attention to detail, punctuality and our mindset that we are not merely towing a car, but transporting their automotive investment. If you have any questions at all, please feel free to browse our Frequently Asked Questions page. If you don't find your answer, call us or fill out our contact form and someone will get back to you as soon as possible. 890 W. Los Angeles Ave.
© Copyright 2013 www.BenchmarkTransport.com, All rights reserved.